After reading Joe Abercrombie's brilliant First Law trilogy earlier this summer, I was desperate to read Best Served Cold. Luckily, I could grab a copy quickly (unlike a number of books here in the UK), and off I went. Set in the same world as Abercrombie's First Law trilogy (The Blade Itself, Before They Are Hanged, Last Argument of Kings), Best Served Cold unveils the new scenery of Styria, a country rife with civil war, brutal politics, and - seeing an eager opportunity for profit -, the mercenaries. One such is the Thousand Swords, a mercenary army led by Monzcarro Murcatto, the Snake of Talins. But when the popular Murcatto "takes a fall" from the balcony of her employers' mountaintop palace, it's time for - yes, revenge. The fairly basic plot is complicated by, well, complications - and one great twist for an ending. Best Served Cold is written in the style Abercrombie does best - cynical, amusing, and gritty. In fact, even more so than the First Law trilogy. It's an eclectic mix of cynicism, humour, and adventure - but despite this, it's lost some of the First Law's flair. It's not quite so humorous, and the characters certainly aren't quite so invigorating. Styria, likewise, provides a grittier setting, but perhaps doesn't give all of the room to showcase what Abercrombie did best in the First Law - intrigue, conspiracy, and life in a "typical fantasy city". My conclusion? 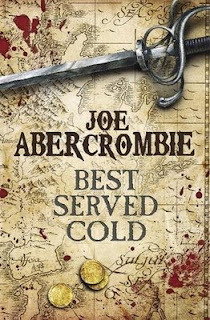 Best Served Cold is certainly Abercrombie, but the First Law's world, in my opinion, succeeds better in complimenting Abercrombie's unique style. Hello Jacob. I have started following your blog as the books you are posting about are books I have or will be reading. Best Served Cold is on my list to read and then talk about over at Barnes & Nobles online bookclub. I think this may be for Nov or Dec. I can't remember, it may even be for next year. But, anyway, I am currently reading The Blade Itself for there and will slowly get to the next 2 books, along with Best Served Cold. Thanks for your review on the book. Great review!